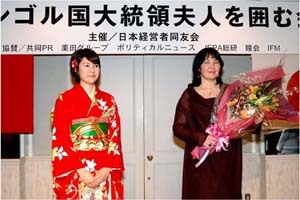 Chairman Shimoji was invited to the celebration of October 17, 2007 held at the US Capitol. 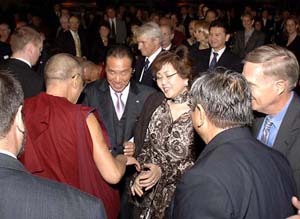 President Bush said that the Dalai Lama is a “universal symbol of peace and tolerance, a shepherd of the faithful and a keeper of the flame for his people.” He requested Chinese government to meet and accept Dalai Lama, saying that Dalai Lama won the respect and affection of the American people. The Dalai Lama says he just wants “real autonomy” for Tibet, not independence. Next day of October 18th, Celebration was held at the Mellon Theatre in Washington DC where President Shimoji, Representative Director Tokuda and Mrs. Ikegami, JEPA member, were invited. At the party, JEPA delegation was seated in the same table as Mr. Richard Gere, one of the top US actors who is well known as a believer of ardent Lamaism. Chairman Shimoji once has met with Mr. Gere to discuss about future cooperation. This Celebration became a good chance for both to renew their friendship. It seems that clouds is hanging over the steady growth of the economy that lasted several years, for the influence such as recent high crude oil prices, the issue of sub-prime problems and etc. A medium and small-sized business and the local economy are the still severe situation. The expansion of the domestic demand is first priority. However, at the same time, we believe it would be important medium and small-sized businesses to launch into overseas market as well. We would like to continue supporting these activities. Best wishes for the New Year. 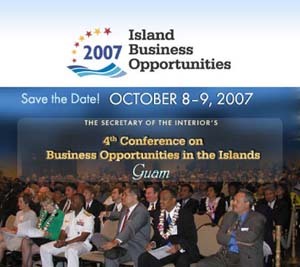 The 4th “Business Chance in the Islands Bureau Director Conference” was held in Guam in October 2007. Governors of the Islands under the jurisdiction of the US had made earnest presentations on their islands possibilities to invite business participation from mainland US and Asian countries. For the first time, seven Japanese enterprises participated the conference through the introduction by JEPA. Some of them joined talks of the business with other participants positively and seemed to have found some beginning. We look forward to that we can report to you as success examples in the near future. On the occasion of the official visit to Japan of the President and First Lady of Mongolia, Mrs. Onongiin Tsolmon, JEPA sponsored “A Banquet in Honor of the First Lady of Mongolia”. 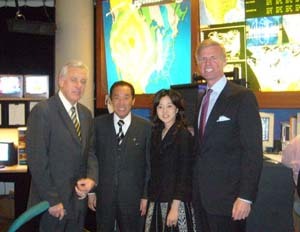 Chairman Shimoji and Representative Director Tokuda visited Washington DC to meet business partners. They also visited Mr. F. Ryan, president & COO of Allbritton Communications, one of the affiliated companies of ABC broadcasting. The Mongolian Chamber of Commerce and Industry Chairman Oyuncorol Duramusren visited JEPA, and it conferred with Chairman Shimoji. 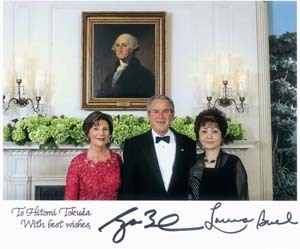 Chairman Shimoji, Representative Director Tokuda and Mr. Sakanaka, publisher of Political News, visited White House to attend annual reception hosted by US President Bush. 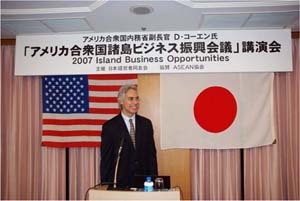 JEPA hosted “Lecture Meeting on the 2007 Island Business Opportunities by Mr. D. Cohen, Deputy Assistant Secretary, US Department of the Interior, Insular Affairs” in Tokyo. 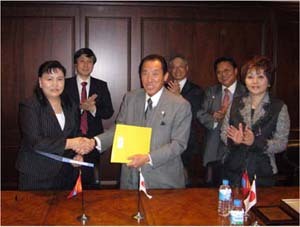 JEPA recruited and sent seven Japanese enterprises to participate “2007 Island Business Opportunities” in Guam. Mr. T. Fukui, the President of Bank of Japan, told that an economic assessment by the government did not have the sense of incongruity. 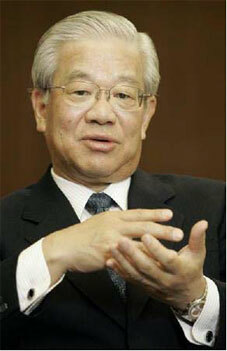 Mr. M. Oku, President of Sumitomo Mitsui Banking, stated that carefulness was necessary to support US Sub-Prime fund. 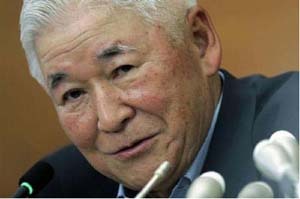 Japan Business Federation suggested in its report of "The Management Labor Policy Board Report" that companies where achievements are brisk should accept a wage increase. in the Annual Spring Offensive this year.